Freemasonry is a fraternal organisation that arose from the loose organization of medieval masons (i.e. stone workers) working in the medieval building industry. Freemasonry in Canada traces its origins to the United Grand Lodge of England, the Grand Lodge of Scotland and the Grand Lodge of Ireland, as a result of Canada's history as a dominion within the British Empire. Freemasonry in the United States, including Prince Hall Freemasonry, also influenced the formation of Freemasonry in Canada. 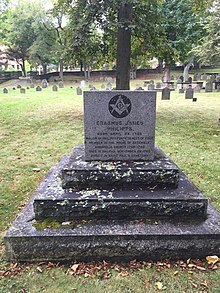 Erasmus James Philipps became a Freemason while working on a commission to resolve boundaries in New England and, in 1739, became provincial grand master for Nova Scotia; Philipps founded the first Masonic lodge in Canada at Annapolis Royal, Nova Scotia. At the time of confederation in 1867, eleven men of the 37 Fathers of Confederation were Freemasons. Charles William "The Big Bomber" Conacher, Sr.
John Ross Matheson - Lawyer, Judge, MP for Leeds (1961-1968), Helped develop the maple leaf flag and the Order of Canada. Membership numbers could be overstated, as membership in multiple lodges is actively encouraged. There appears to be a number of other supreme bodies in the country, including Grand Orient de France Amerique du Nord, Obédience Mixte Nord-Américaine: George Washington Union, Grand Orient du Canada, Grande Loge Autonome du Québec, Grande Loge Mixte du Québec, but the information on them is not readily available. The Grand Lodge of Scotland has a District Grand Lodge of Newfoundland and Labrador responsible for 11 lodges. The Grand Lodge of Alberta also includes the Northwest Territories, particularly a lodge in Yellowknife, although there used to be a lodge in Inuvik in the 2000s (Far North Lodge). ^ "What is Freemasonry?". www.freemason.com. Retrieved 2017-06-10. ^ Michael Jenkyns (July 2017). "Canada's Sesquicentennial - Freemasonry and Confederation". Grand Lodge A.F. & A.M. of Canada in the Province of Ontario. Archived from the original on 5 December 2018. Retrieved 5 December 2018. ^ McKeown, Trevor W. "Canadian Masonic Prime Ministers". freemasonry.bcy.ca. Retrieved 2017-06-10. ^ Developers)905-785-9906, Gouda Inc. (Web. "Famous Masons". www.torontomasons.com. Retrieved 2017-06-10. ^ Yumpu.com. "Bro Alexander Roberts Dunn, VC - Grand Masonic Lodge of Alberta". yumpu.com. Retrieved 2017-06-10. ^ "Today in Masonic History - Miles Gilbert "Tim" Horton is Born". www.masonrytoday.com. Retrieved 2017-06-10. 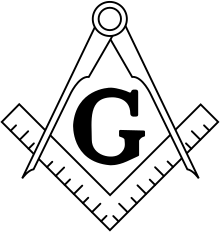 ^ "Famous Masons". www.highland762.com. Retrieved 2017-06-10. ^ "Today in Masonic History - Derwyn Trevor Owen is Born". www.masonrytoday.com. Retrieved 2017-06-10. ^ "Today in Masonic History - Clarendon Lamb Worrell is Born". www.masonrytoday.com. Retrieved 2017-06-10. ^ a b c d e f g h i j "Masonic Membership Stats". www.msana.com. Retrieved 2018-10-24. ^ a b "Brief History". Prince Hall Ontario. Retrieved 2013-05-22. ^ "Craft Lodges". Prince Hall Ontario. Retrieved 2013-05-01. ^ "Loges symboliques - Craft Lodges". GLQ. Retrieved 2013-05-14. ^ "PEI Constituent Lodges". GLPEI. Retrieved 2013-05-15. ^ "Grand Lodge of Saskatchewan". GLS. Retrieved 2013-05-15. ^ "Membership Statistics (as of 2009)". GLBC and YT. Retrieved 2013-05-15. ^ "Lodges - Grand Lodge of Alberta". Grand Lodge of Alberta. Retrieved 2018-10-24. ^ "Le Droit Humain au Canada". Loge Delta. Retrieved 2017-10-20. ^ "Lodges". GOdQ. Retrieved 2013-05-01. ^ "Lodges Reaa". GLNC. Retrieved 2013-05-01. ^ "Logias Jurisdiccionadas". GLLEdC. Retrieved 2013-05-01. This page was last edited on 23 April 2019, at 23:45 (UTC).